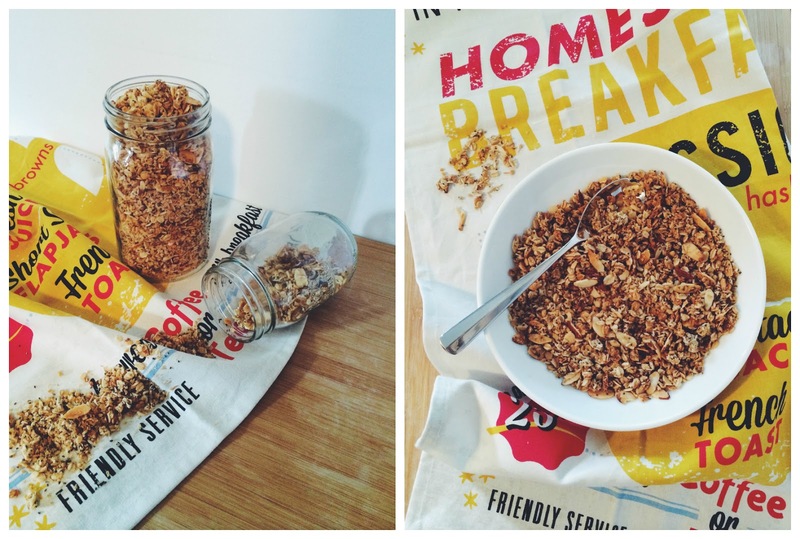 I have been on the search for a healthy & hearty granola for quite some time. Traditionally, while often thought of as a "health food," most granola is simply sugar + empty carbs with little nutritional value. The key is finding one that packs superfoods into it but that still has the full flavor many all of us crave. And as a busy Mama, some mornings all I have time for is a quick bowl of granola before Olivia and I head out the door. Plus, a lazy Saturday morning in bed with a bowl of homemade granola, a stack of picture books and a pajama-wearing toddler next to you...really, that is what weekends are about. This recipe is a new favorite in our home -- my husband has been devouring it plain and atop greek yogurt, and I've been enjoying it with cold milk in the mornings alongside scrambled eggs. 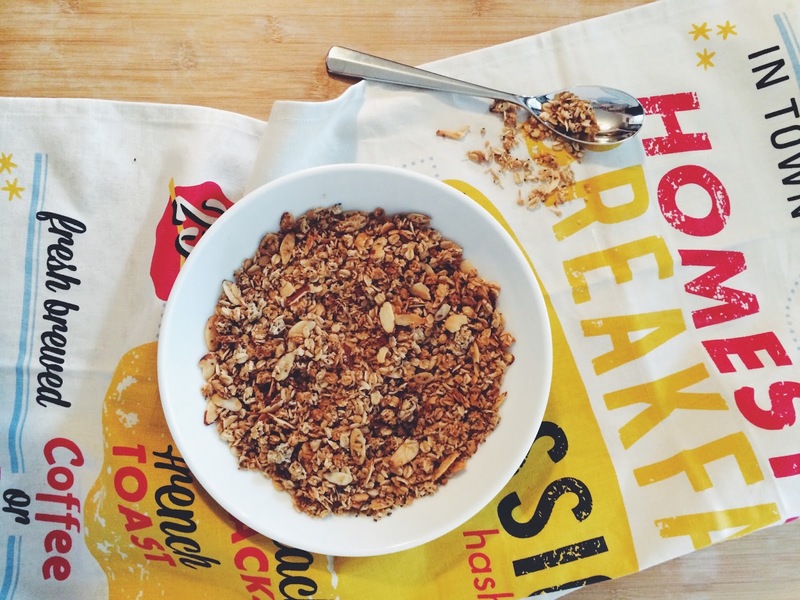 This granola is the bee's knees. Baked until crunchy and golden brown, it is packed with quinoa, coconut, flaxseed & sliced almonds, and finished with chia seeds & coconut butter, plus maple syrup for sweetness. The coconut flavor itself isn't overpowering but adds just the right punch & the quinoa makes for a surprisingly yummy flavor profile alongside the crunchy chia seeds and toasted almonds. Serious yum. 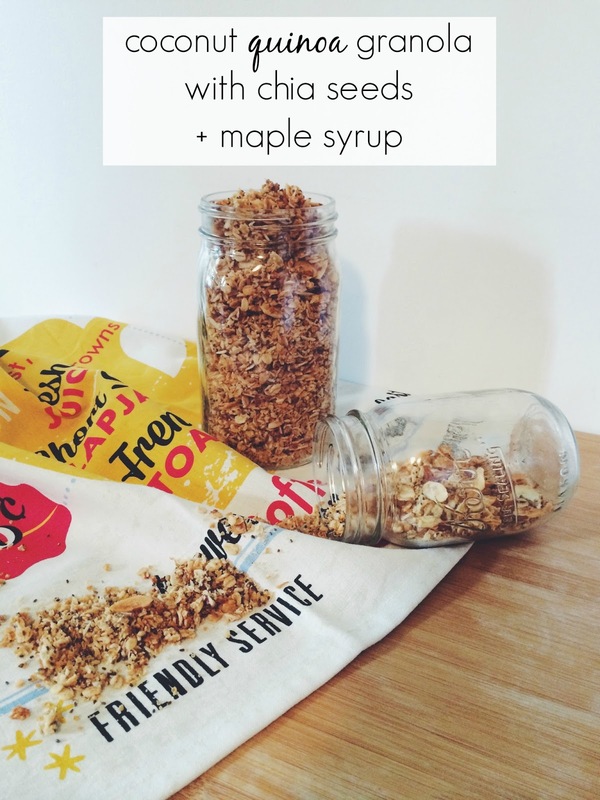 *You could also increase the oats to 3 cups + quinoa to 2 cups, which I plan to do the next time just to make a bigger batch since it doesn't last long in our house! » once golden brown, let cool completely || store in airtight container or glass jar & enjoy!